The Bixpy Outboard Kit for Kayaks includes a thruster and an outboard power pack with a wireless remote control, charger and kill switch only. You will need to purchase an adapter for your specific kayak. Please scroll down to purchase the adapter that is suited to your kayak. Once you have selected your adapter, it will automatically be added to your shopping cart. If you need more details about the different adapters we offer, please click here. After a full fishing season of use in both estuary and fresh water lakes and in a full range of weather conditions, I feel able to offer some comments and observations regarding a Bixpy Jet Drive when fitted to the Feelfree Lure 11.5 Kayak. I opted to mount the device on the rudder reasoning that it would assist manoeuvrability, but had reservations about attaching it to the factory fitted narrow blade rudder that came with the craft. My solution was to fit it to a Viking Angler rudder with its ‘up lift’ mechanism (as per my expectation this provided a more substantial fixing whilst preserving much of the rudders’ function). The install called for a 10mm rebore of the existing rudder gudgeon pin hole to free up the swivel (just dropped the slightly wider drill bit down the existing hole). In addition I housed out the new blade to the Bixpy profile in order to recess the unit and gain better clearance over submerged objects. The drive presently sits about 200 mm or 8 inch below the water line and the whole system is steered using the original footrest toe controls. Under power I estimate that I can turn the craft inside a 10 metre, 30 foot circle. My kayak tracks perfectly and there is no perceivable front t o back imbalance. Perhaps I should describe the rudder system in a little greater detail as I consider it a success. I have two bungee cords running from either side of the rear gear track raised metal eyelets to the rudder’s armature to automatically centre the blade when the steering is relaxed. I ran a new larger diameter paracord through a cleat and a sequence of rear track eyelets to a point where I added a free running micro pulley before crossing the stern to a fixing. The pulley has a detachable connection to the ‘up-haul and always rides in the centre of the triangulation such that it enables me to raise and lower the whole rudder/drive out of the water whilst keeping it square to the back. I now use the original rudder cord (redirected through the rear moulded handle and diving down to the lower leading edge of the blade) to supply downward pressure for a proper deployment and to enable it to be locked down in reverse (I haven’t needed it yet as the rudder deploys under the weight of the motor and the up-haul works perfectly well). As to the Bixpy Drive system? I love it. This is a quality product that has yet to disappoint. I intended to use the device to augment paddling, and provide a measure of safety, but confess that so far I have used it almost exclusively. I even land the kayak by powering up and then lifting the drive clear and shutting it down as I beach the craft. I have yet to run out of power in my many three to four hour excursions and in spite of putting the unit through its paces. The battery has never been fully exhausted and recharges over a lunch break though I haven’t timed it. I have learned that the greater part of the ‘through the water speed’ is obtained in the first 5 button range with almost 1 kmph per click. Button clicks 4 to 6 achieve a satisfying trolling speed of between 4.2 and 4.8 kmph (2.6 to 3.0 mph, or walking pace) with a very economical power drain. Between clicks 6 and 9 there is a diminishing return for the power applied. With the Feelfree, it tops out about 6 kmph (3.8 mph) depending on the wind and current. In still water conditions it approaches 7 kmph (4.4 mph) and with a tail wind achieves it. The Feelfree has a considerable displacement so the drive, even in mid range, tends to exceed my regular paddling speeds over an extended distance. All speeds are subject to the accuracy of a GPS estimate. Wearing the radio controller on the wrist can lead to frustration when trying to reach for tackle and deal with other gear and it is all too easily tripped in the process. My solution was to place it on a lanyard and wear it either around my neck, or strapped it to my PDF. A difficulty that is perhaps specific to my arrangement and craft, involves the length of the standard Bixpy power cable. It is just a little too short at 1.4 metres to enable the battery to be brought forward under the seat sufficient to view the LED power level indicators, or deal with a connection. Even 1.5, ideally 1.8 metre would make a difference. One minor criticism of the Bixpy Drive system. The angular design of the battery case does not facilitate cable connection; particularly when fingers are cold. I can’t speak too highly of Bixpy, its product and its service (any business that will go beyond its online system to supply back-up parts to remote Tasmania deserves praise. Works great. Removed my pedal drive and placed new kayak jet in it's place. Works perfect. Had issues with power cord initially, which was my error, support team for Bixpy was awesome. Thanks! Not enough can be said for the generosity and tech support from Houman and Daniela and their team at Bixpy. The CCA CAL was lucky enough to have Bixpy as our sponsor for the Biggest Bass caught in our four kayak tournaments this summer. As a Hobie fishing team member, I had seen their product at the Fred Hall Shows as well as at a few of our local Hobie dealers stores…but having the time during our tournaments to talk one on one with Houman really made me want to try one of these versatile little motors. I now have two motors with two different motor mounts for my Pro Anglers and Adventure Island and two batteries so I can extend my cruising range on those, day-long saltwater fishing trips. The Bixpy motor complements the Pro Angler perfectly. The Compact design of the lightweight Lithium batteries allows them to fit as if they were custom made for that spot right under the Hobie Vantage seat… and the remote control fits perfectly on the armrest of that Vantage seat and is always right at hand. The Bixpy has taken me to lots of Halibut, Bass, and Rockfish this season as well as trolling up some of our tasty local pelagics, like Yellowtail and Bonito. Every summer I take my two Pro Anglers up to some high altitude lakes in the Eastern Sierras for some Trout fishing and Crawfish trapping. We did 3 trips this Summer and the Bixpy’s were used every day of our fishing trips including a 14-day trip. We charged the batteries with a small generator each night, and we even utilized the USB outlet on the batteries to charge our phones and power the wireless speaker around the campfire at night. This was an epic summer of big fish for me…I caught 5 trout Rainbow trout over 3 lbs., up to 5.7lbs and one personal best 3 pound Brown Trout this summer and too many small stocker fish to count. 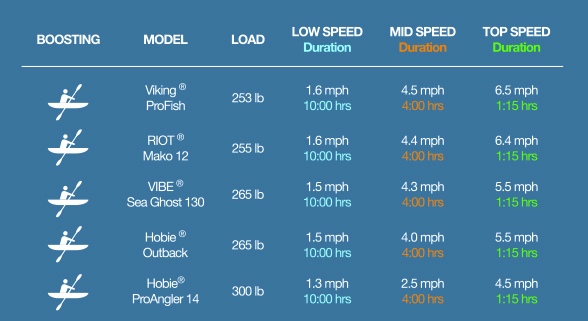 Most of the Trout were caught with the motor while trolling at the slowest speed. A bunch of fish was also caught while trolling at the faster speeds while using the downrigger and leadcore line. It was so easy to set the downrigger and rod with the Bixpy slowly running forward. I have a new Hobie Outback kayak on order, and I can’t wait to try the Bixpy with this new hull design. THANKS for a fun Summer BIXPY…!! !